We have developed two new LED plant light models at 50 and 100 watts which have now replaced our previous 30 and 60 watt lights. Development of these lights has been going on for some time and by trying to solve as many things at once with these new revisions we have been able to increase power, longevity and quality, decrease price and add more features with greater versatility compared to our previous models. During the development process we have been careful to further refine our full-spectrum so that we now provide even better color reflection with an even more natural light than before, although we still use the same plant-optimal wavelengths as in the previous models which affect growth, flowering and fruit development but also wavelengths that affect the color pigment and flavor. In short, the plants get exactly the light they need for them to stay healthy and grow. Cooling is all done passively without any fans thanks to our robust IP65 housing that also allows for it to be used in wet environments or even outdoors. In addition we now use a detachable power cord, which means that you as a grower choose the cord length that best suits you with options of 1, 3 and 5 meters. We use a thermal resistant borosilicate glass lens with a beam angle of 90 degrees allowing for better light coverage than previous models, but mainly it provides a better light throughput without any risk of the lens taking damage and warping from the heat of the LEDs over time which is not uncommon on lights that use regular plastic lenses. Using borosilicate glass lenses cost more, but they do provide much better quality both short and long term. The lights are delivered complete and ready to be used out of the box. It comes with bracket that allows for mounting on wall or ceiling. 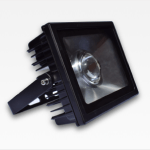 After being mounted, the light can be rotated around its bracket 360 degrees so that the light can be directed where it is needed and has the best visual affect on the surrounding area. Much of the time spent on development has gone into ht LED circuit board. The prior model this lamp has replaced used individual wavelength LED chips that were all visible when looking at the underside of the lamp. In these new model we use the same wavelengths as before but instead using the latest LED technology where we placed all our chips on in a small circuit, known as COB (chip on board). By doing this we achieve a much better mixing of our different wavelengths thereby improving on the visual aspect where individual wavelengths are no longer directly visible. Our new lights look more like a regular lamp while it maintains all functionality for plants and more compared to its predecessor. In addition to the overall more pleasant visual impression from the light we have also added dimming capability which allows you to control the light intensity with external dimmer/voltage regulator. Electronics are now fully produced by machine which increases both the stability and lifespan of the lights. Although this plant lights has a total power consumption of 50 watts they are produced with a total of 100 pieces of LED chips on the board. By lowering the current to half of what the chips can handle we can further secure the products life span. After carefully reviewing and improving different parts of the production process we have been able to almost double the effect of the light compared to the previous model and added new functionality while managing to keep these new lights in the same price range. We have achieved this in part through directly working with different factories as well moving some parts of the production back to Sweden allowing us to provide a better customer price meanwhile having better control over production and quality control. We have developed our own unique spectrum that we have optimized for plants as well as people. Gemma's philosophy is to provide plants with the spectrum they require at all stages of growth and development as efficiently as possible but are just as well comfortable to use in everyday or working environments to enhance and promote well-being. Unlike other manufacturers of plant lighting, we have a broader spectrum that is not exclusively adapted to chlorophyll but takes into account all groups of plant pigments while combining these wavelengths in a ratio that provides a high color rendering index which brings out all the colors and hues of the plants in an effectual but well balanced way. Our spectrum is thus suitable for year-round use, can be used for all types of plants and promotes leaf, stem, flowering and fruit development. This lamp is suited for smaller grows or support lighting for indoor plants, trees and palms where daylight does not reach or there is to little of it. This 50 watt plant light is suitable for planting seedlings, vegetating, flowering and/or fruiting but also for the maintenance of plants all year round. It is suitable for illuminating plants up to 2 meters in height that occupy an area of 1-2 sq.m. and then placed at a distance of about 1-2m from the floor.